According to NBC News, As of Wednesday, 24,024,621 million early and absentee ballots have been counted nationwide in all states with early voting activity. This has far surpassed the early voting of the last midterm election in 2014. As per NBC News analysis, 43% of early voters are Republican and 41% are Democrats. At this point in 2016, 43 percent of early voters were Democrats and 40 percent were Republicans … and we all know how 2016 went, don’t we? Republicans tend to vote in larger numbers on election day than Democrats; however, it also appears that Republicans voters have also come out in larger numbers in early voting. It will all depend on which side turns out the vote on election day. The NY Times also has an analysis of 18 states and their early voting. Six days out from Election Day, over 24 million votes have been counted as early or absentee, a number that exceeds the total nationwide early vote from 2014. As of Wednesday, 24,024,621 million early and absentee ballots have been counted nationwide in all states with early voting activity. Six days out from Election Day during the last midterm in 2014, just under 13 million (12,938,596) early or absentee ballots had been counted — a difference of over 11 million — signifying that voters could be shifting more and more toward early voting. Wednesday’s early vote total even surpasses the total nationwide early vote from 2014, which was over 21 million (21,218,015). In all of the key states NBC News has been following, early vote counts for so far this year (Arizona, Florida, Georgia, Indiana, Montana, Nevada, Tennessee and Texas), the six-day-out total is higher in than it was in 2014. The national trend toward early voting has been close between the two parties. The question is, will the voters want to halt a booming economy and the amazing things that Trump and the GOP are doing in the United States after 10 years of a stagnant economy and the weakest return from a recession ever under Obama? Or will America hand power of to the likes of the liberal Nancy Pelosi, Chuck Schumer, Pocahontas Elizabeth Warner, socialist Bernie Sanders, and insanoid Maxine Waters who wants to do nothing for the American people, but just impeach 45. On Tuesday America, the choice is yours. After all these years America is finally moved forward, do we really want to go back to the Obama years? The Democrats have become what they have accused Trump of. Who on the Left is condemning the rapper TI’s video? Oh, and this isn’t disgusting, exploitative and misogynist? Democrats lose when they show exactly who they are. James O’Keefe and Project Veritas have exposed another Democrat politician for the fraud and lair that they are. This time it is Democrat Senator Claire McCaskill of Missouri. McCaskill is in a close race with GOP challenger Josh Hawley. The undercover video exposes exactly what many of us already know, a Democrat in a red state won by Donald Trump in 2016 has to lie to the voters. McCaskill’s campaign will say anything to get the moderate Republican vote and then do just the opposite once elected. To the people of Missouri, McCaskill voted against the tax cuts, she voted against Kavanaugh and pretty much the entire Trump agenda. Why would you want this representing you and halting all that President Trump has accomplished in less than two years? Why would you want Chuck Schumer (D-NY) to be the Senate Majority leader? Vote for Josh Hawley and help make America Great Again and continue the Trump agenda. There is no reason why this race should be close. Don’t be fooled Misouri, show McCaskill the door. UPDATE I: ‘People Just Can’t Know That’: McCaskill, Staff Exposed In Undercover Sting Video. Nicolas Starost, who also works McCaskill’s campaign, says in the video that former President Barack Obama isn’t campaigning for McCaskill because she doesn’t want to be cast as too far-left, even though she believes in the same policies that Obama does. “And they essentially have the same views on everything?” the Project Veritas journalist asks. UPDATE II: From The Gateway Pundit: Claire McCaskill Responds After Project Veritas Reveals She’s a Complete Fraud … Blames her Opponent. Claire lied some more, blamed Josh Hawley for the undercover video. Senator McCaskill: I’ve been very up front about all my positions. I remember this person was trying to get me to say something different than what my positions are… It is startling that Josh Hawley would be part of fraudulently embedding something in my campaign. In a recent Valley News Live poll conducted by Strategic Research Associates of Austin, Texas, Republican U.S. Senate challenger in North Dakota Kevin Cramer is ahead of incumbent Democrat Heidi Heitkamp by 10 percentage points, 51%-41%. 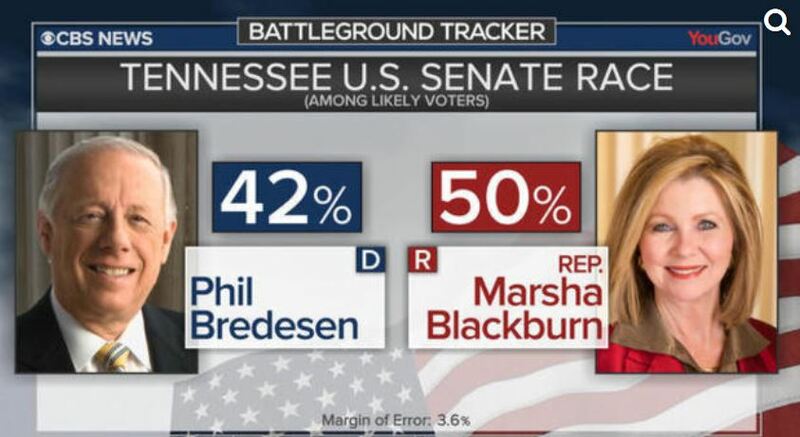 If this trend continues, Republicans will be picking up this Senate seat in the 2018 midterm elections. Even more damning to not only Democrat incumbent Heitkamp, another question asked during the poll stated that 60% of the likely voters in North Dakota support the nomination of Brett Kavanaugh to the U.S. Supreme Court, while 27% were opposed. This forces Heitkamp into a precarious situation, and not just her, all Red state Democrat Senators where Trump won overwhelmingly in 2016. The Kavanaugh nomination has now become a voting issue for the 2018 midterm elections as the Democrats have way overplayed their hand. Republican candidate Kevin Cramer is ahead in the latest polling by Valley News Live on the U.S. Senate race in North Dakota. The poll, conducted by Strategic Research Associates of Austin, Texas, has Cramer in front of the incumbent Democrat Heidi Heitkamp by 10 percentage points, 51-41. The difference is in male voters, where Cramer garners 56.% to Heitkamp’s nearly 35%. Females are virtually tied (46.6%-46.5%). A total of 650 likely voters were surveyed between September 17-27th on both landline and cell phones. In another question that VNL asked, 60% of the likely voters in North Dakota support the nomination of Brett Kavanaugh to the U.S. Supreme Court. 27% were opposed. RCP now has Republican Kevin Cramer up by 6 points, 49% to 43% over incumbent Democrat Heitkamp. 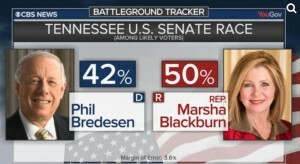 Look for this state to flip Republican.